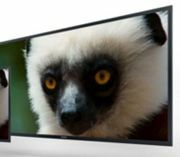 Sony demonstrates 56in 4K OLED monitor | What Hi-Fi? While we wait to see what Sony will do in the OLED TV market, where it has a joint venture with Panasonic to develop the technology, it's showing an entire range of OLED screens at the National Association of Broadcasters 2013 trade show, now on in Las Vegas – including prototype 30in and 56in models. It's refreshing its Trimaster EL monitor range from top to bottom, with new 17in and 25in models featuring greatly improved viewing angles, with off-axis colour shift reduced by 50%, and available in versions to suit high-end cinema and broadcast, ordinary broadcast and production and other monitoring applications. And it's showing both those prototype screens alongside the new range, with the expectation that the 30in model, developed internally, will be on sale next year. The 30in model offers 4096x2180-pixel resolution, while the 56in model is 3840x2160 pixels. Sony says the launch of the 30in model is intended to accelerate 4K production in the TV industry, and has also announced at the show that it's been selected by long-term partner Telegenic to design and build one of the world's first 4K outside broadcast trucks. The new vehicle will support multiple cameras, making it suitable for live events such as sports, and will be able to capture live footage in HD or 4K, along with 5.1-channel sound. Mark Grinyer, Sony's Head of Business Development for 3D, 4K and Sports, says that 'with this latest announcement we’re set to unlock the potential of 4K in the live environment.